Over the last few decades, consumer attention has turned toward natural solutions for beauty – especially when it comes to skin. Who wants to get plastic surgery, or deal with the negative side effects of chemical treatments – not many. But, consumers do want to look and feel better, so they seek natural, nontoxic alternatives. 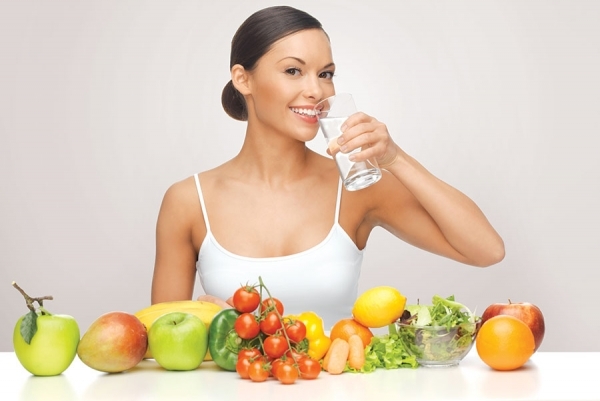 Deciding to improve skin through nutrition and natural products is easy. Knowing where to start? Not so much. Today, life is busy and starting a 12-step beauty overhaul program is not the answer for many clients– or one they can stick to. When aiming to improve skin health and beauty, it is critical to encourage clients to stay away from toxic ingredients in so-called healthy beauty products and commit to three simple rules. First, advise clients to choose organic, locally-sourced food, when possible. Incorporating more natural food and less processed junk, and keeping healthy, nutritional snacks and meal replacement drinks on hand for last-minute emergencies will help clients maintain a balanced diet. Second, encourage them to drink more water. Dehydration is the natural enemy of skin health, causing skin to become dry, lose plumpness and elasticity, and develop wrinkles, lines, acne, spots, and other unhealthy and unsightly problems. Keeping clean, pure water available at all times and remembering to drink throughout the day encourages skin hydration. Third, suggest good supplements. High-quality supplements provide everything the skin needs that the earth can no longer provide. Recommend supplements that provide full-spectrum vitamin and mineral support using the best, naturally-sourced ingredients. They help stop the effects of toxins in the atmosphere and keep bodies running at their optimal best. Today’s savvy consumer knows that one of the best ways to enhance healthy skin is to pay attention to what is in the products used and understand how those ingredients affect the skin and body. Many beauty products in the market today try to seduce consumers with labeling that says natural, nontoxic, organic, simple, and safe. But, in an industry with very little regulation, it is shocking to find out what is actually in those products. Many commercially-produced beauty and skin care products are packed with artificial colors, fragrances, preservatives, and stabilizers that can cause negative long-term health effects. Because of this, there are hormone-disrupting ingredients in skin care, cosmetics containing lead and other heavy metals, carcinogens in shampoos, and many more harmful chemicals in products used every day. Over a lifetime, these harmful exposures can add up, which is why it is more important than ever to encourage consumers to research what ingredients are in products being considered. If considering using a nutritional or skin care supplement, make sure it is from a reputable company. Look for a company that offers third-party validation – such as from Consumer’s Lab or NSF – and that creates supplements in a Good Manufacturing Practice (GMP)- or FDA-manufacturing facility. One step better is for products to be made in an OTC facility, which requires a higher level of scrutiny, detail, and manufacturing consistency. Next, do not be convinced by labeling that says natural, organic, nontoxic, hypoallergenic, or physician-approved. These all sound great, but no industry regulation means that these claims do not have to be backed up. The exception is if the label also lists third-party validations from reputable organizations such as EWG, Consumer’s Lab, Certified Vegan, NSF International, the ToxicFree Foundation, and the Natural Products Association (NPA). This is all information that is easy to find on the internet, easy to verify, and important for finding the best quality supplements to support the skin’s health. A steady supply of key nutrients is essential to support the skin’s health and its ability to fend off damage from environmental stress and aging. Encourage clients to eat the correct balance of foods – like those listed below – so the skin will receive the vital nutrients it needs. Fruits and Vegetables: Every nutrition plan should include a rainbow of fruits and vegetables to get the benefits of powerful antioxidants that help to protect skin from the cellular damage caused by free radicals. Aim for at least five servings daily. Vitamin C: One of the most powerful antioxidants, vitamin C can be found in sources such as citrus fruit, blueberries, broccoli, strawberries, red peppers, and sweet potatoes. Vitamin E: Foods rich in vitamin E help protect the skin from cell damage and supports healthy skin growth. Foods high in vitamin E include almonds, avocado, hazelnuts, and pine nuts. Reds and Oranges: The compound that gives tomatoes their rich color, lycopene, is a powerful antioxidant, as well. 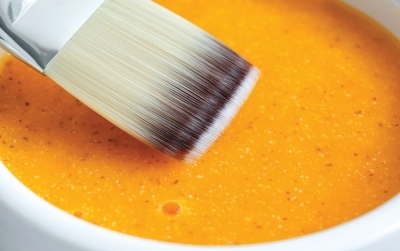 Fruits and vegetables rich in carotenoids also color skin with a healthful glow. Carrots are filled with vitamin A from carotenoids. Vitamin A prevents the overproduction of skin cells which can lead to clogged pores and skin cancer. Folate: Spinach is rich in folate, a B vitamin that aids in the skin’s ability to repair damage. Greens like spinach, kale, turnip greens, dandelion leaves, broccoli, and asparagus are all rich in vitamin A, iron, and vitamin K. Iron aids circulation by carrying vital oxygen, while vitamin K may help prevent varicose veins. Heathy Fats (Monounsaturated and Polyunsaturated): Healthy fats, such as what is found in avocados, oily fish, nuts, and seeds, provide essential fatty acids that keep skin supple and improve elasticity. These fats also contain vitamin E to help protect against free radical damage. Whole Grains: Whole grains rich in B vitamins assist cells in processing fats that hydrate and revitalize the skin. The complex carbohydrates mixed with fiber in whole grains are digested and absorbed slowly and do not create sugar spikes that contribute to acne. Overly processed, refined, or bleached grains and sugars should be avoided. Protein: Protein is also vital to the elasticity of the skin. The body needs a decent amount of balanced amino acids coming in each day. Plant-based, protein-rich shakes or supplements are great for adding extra protein to benefit skin health. It is also essential for clients to consider what not to eat for skin health. Once foods that trigger allergies or sensitivities are eliminated, clients should also consider cutting down on known foods that boost oil production, cause acne, and damage the skin’s ability to heal itself – such as chips, fried foods, soda, candy, and excessive caffeine or alcohol. Another very healthy habit for beautiful skin is sleep. This is a sleep-deprived nation and, while many are aware of the negatives that result from other bad habits, few people think about how lack of sleep affects skin health. When sleep-deprived, the body produces more of the stress hormone cortisol. Elevated levels of cortisol can lead to increased stress and inflammation in the body. Increased inflammation increases breakdown of collagen and hyaluronic acid, the molecules that give skin a glowing, youthful translucency. Not enough sleep also accelerates the aging process. Without sleep, growth hormones are not able to repair damage and renew skin, allowing daily small breakdowns to accumulate instead of being reversed overnight. This results in more noticeable signs of aging, with wrinkles, sunspots, flakiness, and other visible damage. Encourage clients to make it a point to get enough sleep. A full night of restful sleep reenergizes the body and gives it the boost it needs to replenish and repair skin during the night, helping individuals to wake up with a glowing, vibrant complexion. Hydration for healthy skin is so important. Bodies need water – and plenty of it. Drinking plenty of water throughout the day is an easy and powerful way to support healthy, beautiful skin. Without water, grapes turn into raisins – and no one wants that to happen to their skin. Water helps to flush toxins, removing bacteria and waste. Water also plumps the skin, helping wrinkles and pores to disappear as they are filled in. What is more, a variety of structures in the skin that support collagen require water to work effectively. Collagen is the body’s most abundant protein and is what makes skin (and muscles – which are also rich in collagen) able to repair and renew cells from damage and the effects of aging. One more benefit from water is that by staying hydrated, skin is less likely to crack and let in external particles that can cause irritations and blemishes. Clients should aim for six to eight glasses of water a day. Keep a filtered water bottle around at all times. Herbal teas are good, too just stay away from too much coffee, soda, or energy drinks which contain frighteningly high amounts of sugar. Snacking on fruits and vegetables, such as watermelon and cucumber, also counts towards water intake, as well as provides beneficial nutrients, such as lycopene. The old argument that individuals get all the vitamins they need from a balanced diet just does not cut it anymore. Scientific data proves that the fruits and vegetables eaten today are not providing the same nutrition as the ones past generations ate 50 years ago. For instance, studies show that one tomato today provides less than half the amount of calcium and a third of iron and vitamin C. And, that list goes on and on. 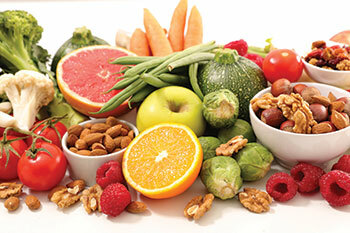 It is important to include nutrient-rich, fresh fruits, vegetables, and whole grains in a diet. But, even with the best of intentions, it is still hard to always be in control of what ends up on one’s plate. A powerful way to stand up for one’s body, though, is by adding nutritional supplements to one’s daily health regimen. Here are a few that support skin health. High-quality vitamin C reduces oxidative stress in cells which helps the skin look better. Try to avoid inexpensive versions in the form of ascorbic acid, which can be hard on the stomach. Instead, look for ascorbate form, which is buffered and will not cause stomach issues. Or, get it through whole foods rich in vitamin C.
Vitamin E is also a potent antioxidant that protects cell membranes and prevents damage. Grape seed extract has a unique ability to fight against free radicals, protecting skin from the inside. Grape seeds are also an excellent source of vitamins C and E, as well as antioxidants known as flavonoids, all of which may improve the skin’s texture and reduce signs of aging. Omega-3 fatty acids. Most fish oil benefits exist because it is one of nature’s richest sources of omega-3 fatty acids. Fish oil nourishes the skin with fat-soluble vitamins that support firmness and elasticity in skin to create a more youthful appearance. Studies have also shown that omega-3 fatty acids in fish oil have properties that protect skin from the sun’s damaging effects. Research suggests that long-term supplementation of fish oils rich in omega-3 fatty acids can lead to greater protection against sun damage and its negative effects on the skin that include brown spots, dryness, wrinkles, lip lines, smokers’ lines, and a dry, leathery appearance. CoQ10 helps cells rejuvenate and reduce cellular damage. CoQ10 is an enzyme produced naturally in the body and found in every cell and tissue. It is involved in a number of biological functions including helping to produce energy, neutralizing free radicals, and keeping cells healthy. A young body has the ability to produce as much CoQ10 as it needs. However, various factors, such as aging and stress, can lower levels of CoQ10. At age 40, natural levels of CoQ10 start to decline, affecting the ability of cells to regenerate and withstand stress. That is why it is very important for women over 40 to add CoQ10 supplements to their diet. Vitamin D helps minimize acne, boost elasticity, stimulate collagen production, enhance radiance, and lessen lines and the appearance of dark spots in the skin. Studies have shown that vitamin D has the ability to protect skin cells from the damaging effects of free radicals and can reduce inflammation and puffiness. Skin conditions such as acne and psoriasis can be elevated by an insufficient amount of vitamin D. This can also negatively impact the body’s ability to heal wounds. With a greater understanding of skin cancer and the negative effects of too much time in the sun, society in general has moved towards a sunscreen-coated way of life. While necessary, this has led to an ever-increasing problem of vitamin D deficiency. While vitamin D supplements can be part of a healthy supplement plan, individuals should consult with a medical professional on the amount that is right for them. Vitamin D is stored in the body’s fat and liver and excess levels can lead to toxicity. Calcium is critical to the health, not only of bones and teeth, but of all bodily organs, including the skin, where it plays a role in regulating the skin’s many functions. Most calcium in the skin is found in the outermost layer and if there is not enough, skin can appear fragile, thin, and dry. Adding calcium supplements to one’s diet supports the shedding of dead skin cells and the production of new skin cells, helping to maintain a luminous, youthful complexion. Before recommending treatments, have a conversation with clients about diet, nutrition, lifestyle, supplements, and products they are using to support their skin’s health. This will help in selecting products and treatments for the client to use topically that will complement their regimen and not compete with it. The bottom line? It really is possible to achieve more youthful, glowing skin through dietary choices. Through research and following good nutrition guidelines, clients can improve not only skin health, but overall health, as well. Deanna Latson, and internationally-recognized health and wellness authority, empowers people to create a healthy, well-balanced life. As co-founder and chief product officer of ARIIX, an international opportunity company devoted to helping others unleash their potential for good, Latson has led the development of toxic-free products through collaboration with world-renowned experts in the health, wellness, and fitness industries. Latson holds a clinical nutritionist degree from the Natural Healing Institute of Naturopathy and her affiliations include the Wellness Council of America, Physicians Committee for Responsible Medicine, and the Speech Communication Association.